Day 21. The big brown UPS truck pulls up in front of my house. The driver, a salt and pepper haired George Clooney type in a snug pair of milk chocolate colored shorts, talks on his cell as he jumps out and walks my way. I don’t normally take note of such, ahem, details but he’s just super handsome. I open the door as he rounds the corner. I, of course, am still wearing pajamas, have bed head and don’t have my tooth in. There’s no way in hell I elicit a similar response in him. He doesn’t bother getting off his cell. 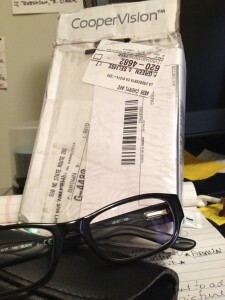 He smiles and hands me two small packages—an envelope and a small box. I mime and mouth, “do I need to sign?” He shakes his head, “no” as he refocuses on his call and heads back to his truck. I squelch the urge to linger and focus in on my bounty instead. Both packages are addressed to me. The envelope is from Legal Zoom, which causes me to jump for joy. I barely glance at the box. I assume it’s something my partner has ordered from B&H Video. My name is on the account so they always ship to me. I toss the box aside and focus on the envelope. It’s the confirmation of my DBA being filed. My new venture is almost official. Yay! It isn’t until this morning that I see the small box is still sitting on the dining room table, unopened. I decide I’d better take another look. Turns out, it isn’t from B&H. It’s from Sear’s Optical. Which only means one thing: It’s my new glasses. My old ones are falling apart, the anti-glare coating is peeling off and they are tweaked on the left side because I sat on them once. The glasses were no match for my robust behind—they got squished. I’ve been looking forward to getting a new pair since my sister and I picked them out when I was in Missouri. I tear open the package and slip them on. Huh. I feel a wave of disappointment. They don’t look like what I remember them looking like which was amazing. I’m not sure I even like them almost two weeks later. Not to mention the bigger issue…they’re so wide they don’t touch my head! They need to be adjusted to fit my face. The worst part is my vision is wonky. I panic. That optician woman must have ordered the wrong strength lenses! Before I finish dialing my sister, my eyes start to adjust, things start getting not just clear but crystal clear. I remember my sister telling me, “your astigmatism is a bit worse so I’m changing your prescription.” Ahhh, that’s right. I can tell. My eyes can tell as they continue to adjust. My perception of how good they look on me starts to adjust too, “maybe I do like them after all.” I adjust my schedule for tomorrow in my mind as I plan to fit in making it to a Sear’s Optical out here so I can get the glasses adjusted so they don’t fall off my head. I’m intrigued (maybe annoyed?) by the idea of necessary adjustments. My eyes have no choice but to adjust to the new prescription lenses, it’s for their own good. And mine. I need to have better night vision. Aren’t I always adjusting to something? Making adjustments for someone? Hoping to be well adjusted? 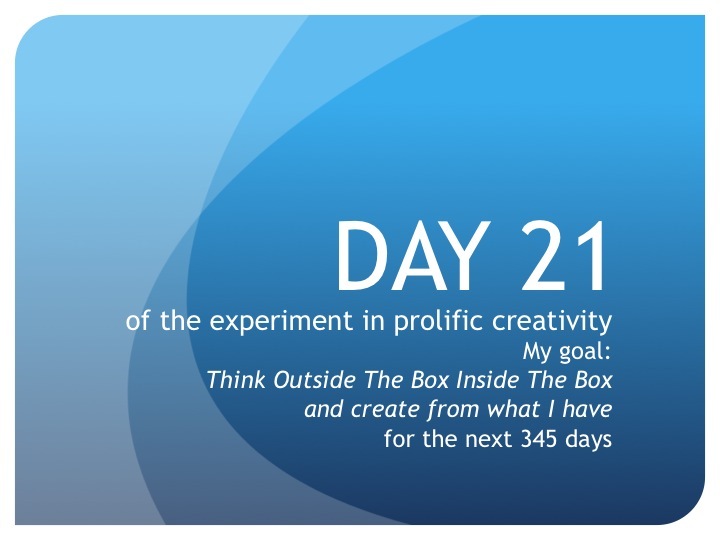 If I really slow down and consider the process of thinking outside the box inside the box to create from what I have it’s nothing but one adjustment after another—adjusting how I do things, how I see things, how I think about things all in order to create from wherever I am with whatever I have right now. To create from what I have, adjustments are necessary. Some are fun, some are uncomfortable, some welcome, some not, but they are a part of the process. Fine. Bring on the adjustments! Throughout the day, my eyes get used to the new lenses and I warm to my look with them on. I’ve adjusted. Until tomorrow, create from what you have…and roll with the necessary adjustments. No need to apologize, because whatever you did in your magical Rx, I can now even see fine print with these glasses. I feel like superwoman. You are officially the best eye doctor in the Universe! Thank you! I’m embracing any and all adjustments from this day forward.